The Magpie Goose has a black neck and head, with a characteristic knob on the crown (larger in males), which increases in size with age. The underparts are white, with contrasting black edges on the underwing. The bill, legs and feet are orange. The Magpie Goose differs from most waterfowl in having strongly clawed toes that are webbed only on their basal halves (i.e. only partly webbed). Females are slightly smaller than males. 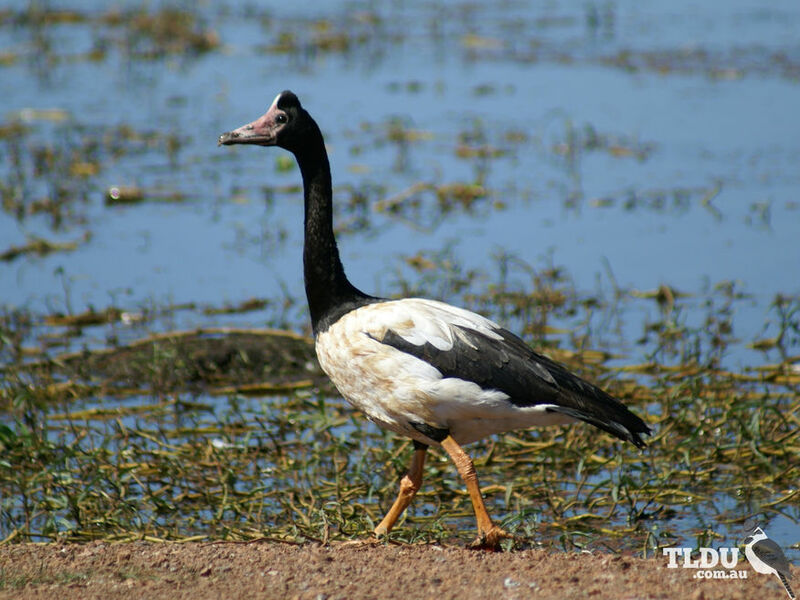 The Magpie Goose is widespread throughout coastal northern and eastern Australia. It can be seen from Fitzroy River, Western Australia, through northern Australia to Rockhampton, Queensland, and has been extending its range into coastal New South Wales to the Clarence River and further south. 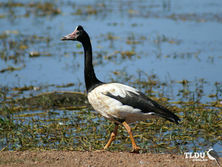 The Magpie Goose is seen in floodplains and wet grasslands. Some individuals, mostly younger birds, may be seen at quite long distances inland. 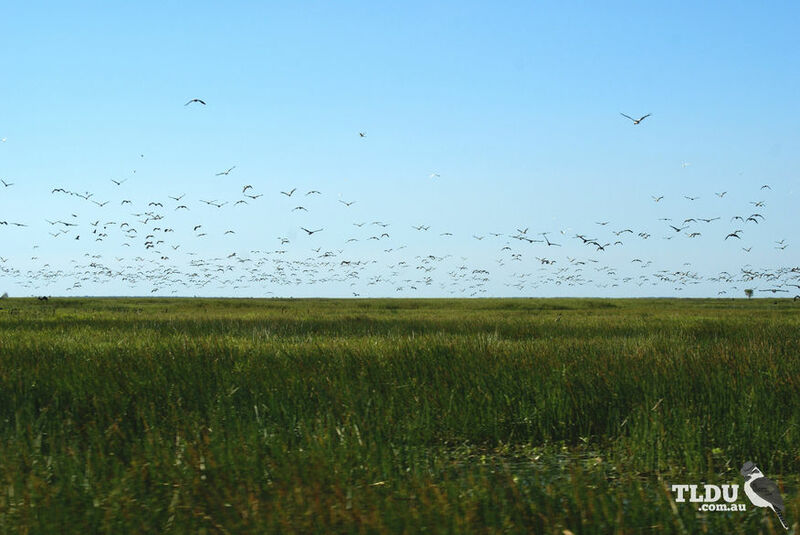 Large, noisy flocks of up to a few thousand birds congregate to feed on aquatic vegetation. The Magpie Goose is a specialized feeder with wild rice, Oryza, Paspalum, Panicum and spike-rush, Eleocharis, forming the bulk of its diet. During the breeding season, Magpie Geese build nests in secluded places, usually close to wetlands. The nest is almost single-handedly constructed by the male. It usually consists of a simple unlined cup placed either in a floating platform of trampled reeds or built in tree-tops. Pairs of geese mate for life, but a male may have two females. Two females may occasionally use the same nest to lay the large, oval, off-white coloured eggs. All adults share incubation and care for the young.